I met Brian Lew through the metal scene when I was living in San Francisco. I’ve since become an avid reader of his blog, ümlaut, over the years. Beyond it always being quite interesting to read his take on a show that I also happened to see, I have always loved reading about his personal story in relation to the original Bay Area Metal scene. As an avid concert goer and writer, I’ve always craved to witness something develop firsthand, maybe be a part of it in some small way. But I’m pretty much resigned to that kind of thing never ever happening again, so I will live vicariously through his posts, green with envy as I know many other of his readers are. I’ve been following the process of his much anticipated book, Murder in the Front Row, which comes out in December, and I recently had a chance to ask Brian a few questions about it. What follows is the story behind the story of what will surely be the coolest yearbook of all time. How did the idea for this book begin? Did it change in scope over time? Over the past couple of years I thought about doing a book and started talking with different people about it. I got more serious when Bazillion Points published Only Death Is Real by Thomas Gabriel Fischer. He’s one of my Metal heroes and the book is as much an art book as it is a Metal book, which I really liked. Ironically at about that time, Harald had contacted Bazillion Points… and then Ian Christe of Bazillion contacted me and asked if I’d be interested in collaborating with Harald on a book; I was surprised when Ian told me he’d been reading my blog for years so he already knew about me. It was funny how things fell together so quickly and easily. Harald and I have known each other since we were teenagers, but we haven’t been in close contact in recent years. He’s constantly on tour with D.R.I. and I think the last time I saw him before this project started was in Ohio at the 2010 Scion Rock Fest when D.R.I. played the main stage. Once the project started it was cool to realize we’re still on the same wavelength after all these years. We decided from the start that we did not want to present ourselves as “the spokesmen” for the original Bay Area Metal scene. There were alot of others involved and everyone has their own stories; it’s a sacred time for many people and we wanted to respect that. Instead we decided the book would mainly be a photographic time machine back to those days.. where you could open the book, see photos, and feel like you’re back in the old days with the photos doing the talking. We’ve kept the text to a minimum; if you were there.. you’ll know.. if you weren’t there the photos will give you glimpse back in time when an influential Metal scene was still very small and local. What drove you to document everything that was happening? Nowadays people are driven to share things like photos on Facebook and what not, but back then, was it just for personal use? Taking photos started as a hobby but once I became involved with the underground Metal fanzines that became the reason for taking my camera to shows. Plus, it was fun! I was just a kid and was mainly just taking pics of my friends who happened to be in bands. Right place, right time since some of those bands happened to be Exodus…Slayer…Megadeth…and Metallica. Was it difficult to photograph these shows and parties? Beyond the shows being super rough, it seems like it would be difficult to haul around a camera (compared to an iPhone nowadays), plus maybe potentially ‘not cool’ to take photos. People with cameras was rare at shows back then so it was never a problem; film and processing was expensive so not a lot of kids took pictures regularly at gigs. It wasn’t an issue at parties or wherever because we were all friends! There was no separation between the bands and everyone else…we were all a big gang. I don’t remember the shows being rough; we were teenagers so the crowd action was all fun. 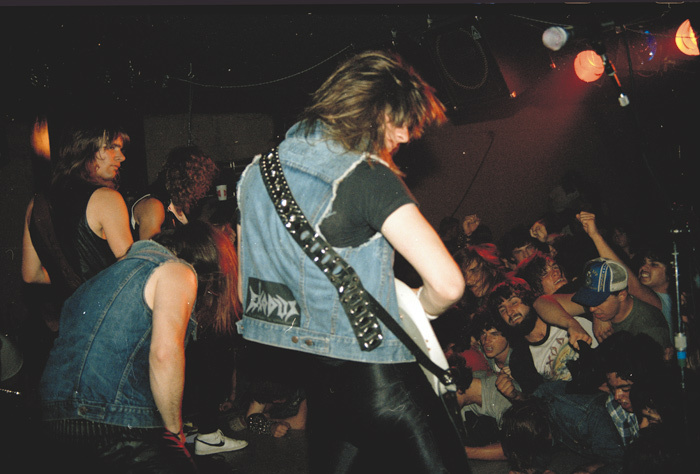 The earliest shows weren’t as out of control compared to shows at Ruthie’s Inn that started later and when head walking and stage diving became the norm. There was no way you could be at the front of a stage with a camera then because it was too violent up front. What was your documentation process like? I’ve always been impressed by how organized your photos and such are, and how you keep track of every show systematically. My documentation process was complete blind luck. For years my negatives just sat in a shoebox and it’s amazing they weren’t lost or damaged as I moved over the years.. but as I got older and started getting requests to use some of my old shots from bands and magazines I got more organized. As far as stories go, my blog turned into my way of documenting memories as I remembered them or people reminded me of things that happened. Was there anything that was lost or not captured or unusable that you really wish you could have included? There were a few photos we couldn’t use because the original negatives couldn’t be found…but there was so many photos between mine and Harald’s that alternative shots were easy to select. Bazillion Points only wanted the highest quality images for the book, so if we couldn’t locate the negative of a print it usually wasn’t used because this is as much a photography book as it is a Metal book. Did you realize you were part of something special while you were in the midst of it, or did it happen later? Take me to the moment when you realized this. When people look at the book they should remember the vast majority of us were just kids, including the bands. In the very beginning there was hardly anyone over 20 years old. There was no way to know how influential or important these bands would become. 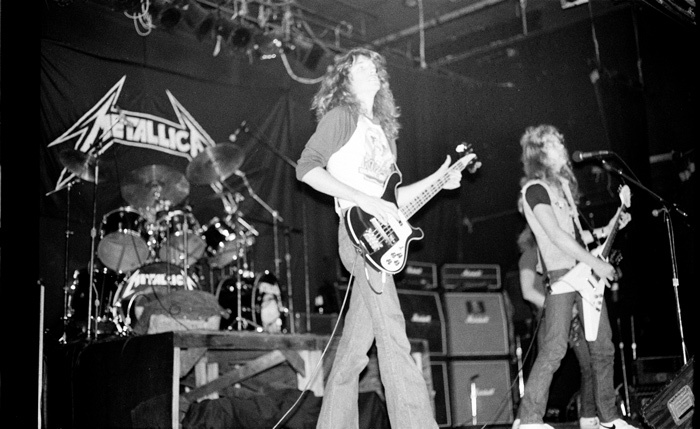 Besides Metallica moving up here, not many people know that Slayer and Megadeth spent a lot of time in the Bay Area in their earliest days…Slayer still talks about their first Bay Area shows in interviews and how important they were to the band…but we were all just kids having fun at the time…us and the bands! The one moment I realized something bigger was happening was when Metallica played the huge Day On The Green show at Oakland Stadium in August 1985. They were 4th on a bill headlined by the Scorpions in front of 50,000 people; the stadium was only 20 minutes from the 2 bedroom house in El Cerrito where the band jammed in the garage. They totally destroyed and it was amazing how powerful they were on a huge stage. They won the crowd over and I remember the clueless hippie Bill Graham Presents stage manager making an announcement to the crowd right after they played and saying “Well… That was interesting…”. Six years later Metallica headlined that same stage at Oakland Stadium. Do you think days where scenes like this emerge are over? I have no idea to be honest. If anything it might be harder for local scenes to have their own unique identities because everything is online and easily shared and accessible now. Back then we’d hear there were Metal scenes going on in places like Chicago and New Jersey but we really didn’t know what that meant unless we had penpals in those places. I have friends who grew up in Chicago and on the East Coast who say the same thing about how they heard about how crazy the Bay Area Metal scene was.. but they could only use their imaginations about what that meant as they listened to bootleg live tapes of Exodus or Metallica shows from here. But back then you had to leave your house to be part of the scene and there were also places to gather and meet people like local Metal record stores.. in San Francisco that was The Record Vault that used to be on Polk Street. I lived in the ‘burbs an hour from S.F. and a phone call to the city was considered long distance and expensive. So, the only way to really communicate with a lot of friends was to meet up with them at The Record Vault or at gigs and that’s how the bonds of friendship happened. 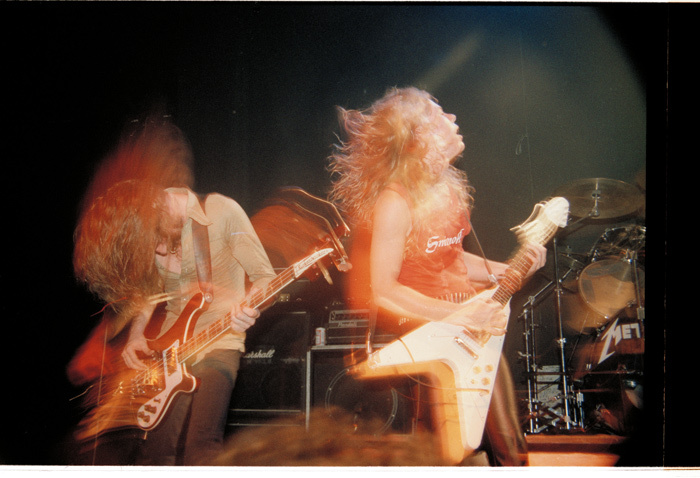 We’d also hang out at various houses in the city and East Bay…with the “Metallica Mansion” being a big gathering spot. It was the house in El Cerrito where James, Lars, and the band’s then-sound guy lived and where the band rehearsed in the garage (aka THE garage from Garage Days Revisited). All of this face time generated a profound sense of local community…I don’t know if that unique local aspect exists in Metal scenes now to be honest. What was it about you that made you a part of/drawn to this scene beyond the music? I was a geeky shy teenager. I liked heavy guitars and darker imagery so I didn’t really gravitate towards Punk. Metal gave me an identity and a way to escape my loneliness and feelings of being an outsider. Metal was an escape for my imagination and my angst. I didn’t have a lot of friends but through the underground Metal scene I met people who were like me and I made friends… and found my own voice via writing for fanzines and taking photos. What is something that you learned about life through being a part of this era that has stuck with you over time? I guess my appreciation for music and not taking it for granted stems from those days…Before the Internets you had to go to great lengths to find import records and even just information about bands. All of that work made me value the music once I found it. It seems like music is disposable to a lot of people now because of how easy it is to find online and download. It’s harder to put value on music when you can delete it with a key stroke. Who is this book for and what do you think they will get out of it? Harald and I both think of this book as our yearbook for the original Bay Area Metal scene. This was the single most influential time of our lives so it’s mainly for the people who were there. 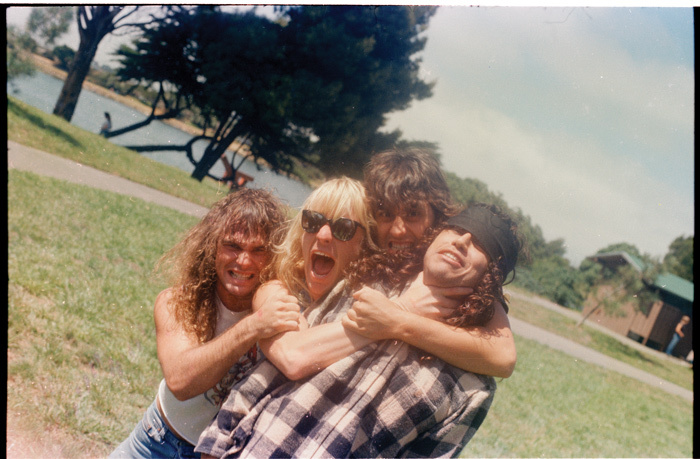 We also wanted to pay tribute to the band Exodus because they were the heart and soul of the original Bay Area scene; the title comes from a line in the Exodus song “Bonded By Blood” and there are a lot of photos featuring them. Hopefully the book will remind the old Bay Area Metalheads what it felt like to be young and invincible; there are a good number of people from those days who are no longer alive. 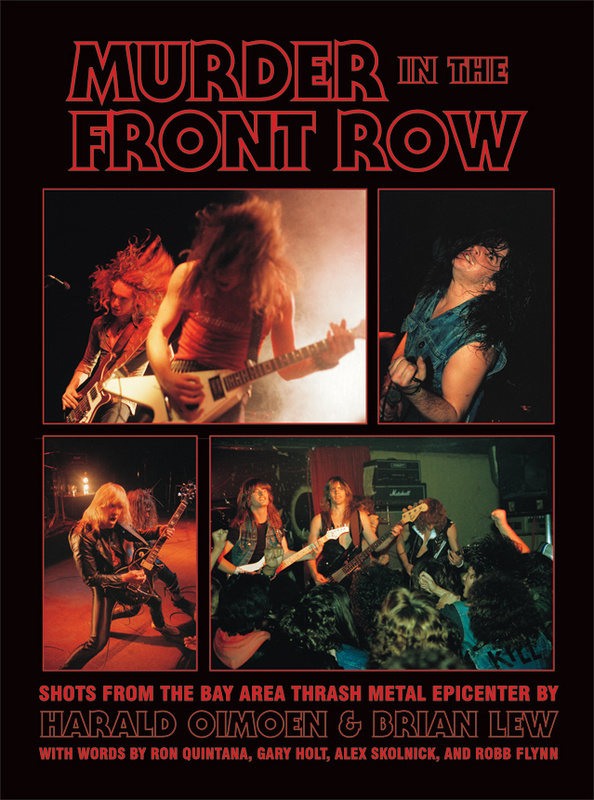 For others, I think the book will show what a special time the original Bay Area Metal scene was and why it attracted bands like Metallica, Slayer, and Megadeth to come up here often during the earliest days of their careers. I think the book will also humanize these now famous bands and show when they were still pimply-faced Metal kids just like the audience. Preorder Murder in the Front Row here.